The drum and various percussion instruments metaphorically represent the diverse generations, cultures and issues, providing an alternate voice for participants regardless of technical ability. The instrument becomes a vehicle of self expression, connecting individuals through a web of sounds connected to each other, groups and individuals form lasting bonds and trust while fostering a nurturing environment where rhythms become feelings that are shared constructively with each other. Drumming connects us with the perpetual rhythms inside our own bodies, by understanding our own personnel rhythms, we learn the effects of our rhythms with others. Thus providing a powerful tool of communicating that unifies the group though cooperative expression. The goal is to create an entertaining atmosphere that encourages communication, understanding and acceptance of one another. 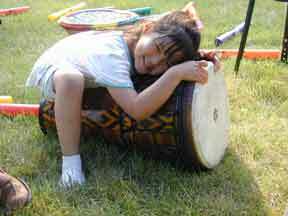 Drum circles offer relaxation, emotional release, and spiritual expression through social interaction. The experience can open doors – encouraging dialogue, help build self esteem, increase camaraderie, and a general sense of well being ! Music making has healing attributes, proven to relieve stress and elevate the human spirit ! EVERYBODY DRUM is a program using drumming, voice, and movement techniques to empower individuals and unite groups through teambuilding experiences.